I am designing a custom AI with my own custom pathing system, as requested by a client! Here's a video of my progress with my very own pathing system! What you see in video is that I am dynamically generating as-large-as-possible nodes to represent open spaces of no collision in the world. My dynamic pathing system generates whatever size shapes are required to contain collision-blocking objects, including physics simulating meshes! My internal data representation is utterly simple, just a point and a radius, though I draw them as boxes to be easy on the engine (spheres take longer to draw in large quantity). In the video I keep dropping physics simulating meshes into the world and you can see how my dynamic pathing system adapts to the changing outlines of the physics meshes!! The AI I am designing will use these nodes to navigate through the world, avoiding objects with collision, to get to their chosen destinations! The larger the node is the better! This means the AI has choice as to how it wishes to path through those larger nodes. Having that much space allows the AI to customize its movement patterns so that each type of creature feels unique, and knows where it can roam free and where it has to fit through tight spaces. The entire process that you see in this video is multi-threaded! I am leveraging our modern technology for my pathing system! The game thread is free! The only thing the game thread is doing is drawing the results as it receives them from my dynamic navigation thread, and it wont even be doing that during normal gameplay! The AI will also be able to be multi threaded, since my core data is USTRUCT, below the UOBJECT level. You can't multi thread changes to UObject data, so my entire pathing system is a series of USTRUCTS. The result of staying at the USTRUCT level is that I can easily multi-thread my entire AI system! This means maximum performance for high speed gameplay with fast and intelligent AI units! Rama's Multi Threaded Pathing System With Physics Support, In Action! My own pathing system which I wrote from scratch, which has fully physics support and does dynamic recalculations whenever needed by each AI unit! My system supports 400 units using it simultaneously, maintaining 60fps! I wrote this whole thing from scratch, the only interaction I have with UE4 movement code is the fact that I am applying velocity to the character movement component (which replicates by the way)! Everything else is being done by my own system! Last edited by Rama; 08-02-2014, 02:59 PM. This is awesome Rama! In fact, this is exactly what I've been looking for! Will you ever release this to the public? Thanks! Once the system is in a more complete form we can discuss this some more! I am glad you like it ! Really nice work! Thanks for posting the video as well! Would it be possible to run AI behaviors dynamically based on whether or not they are in a zone that will contain collision? Example - AI is running through a wide hallway with no objects obstructing their path. Then parts of the cieling begin to fall to the floor. If the AI is below one of the chunks, could you build the AI to be able to analyze the size of the falling object and the best route it needs to take in order to run a few steps and dive out of the way into a safe zone? This I feel would make gameplay very unique and lifelike. 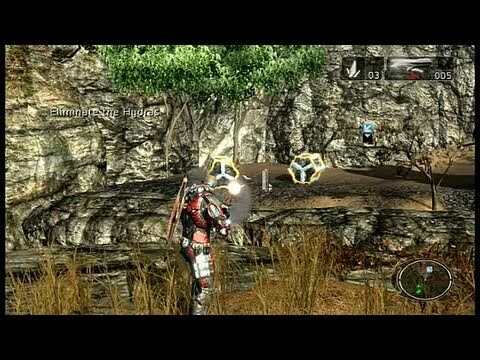 If you were able to build such an ability, you could really take advantage of games where the player has dynamic destruction control over the environment or large scale environmental changes such as terraforming a level. Last edited by JBaldwin; 07-31-2014, 03:43 PM. Sure! Absolutely I can do that! 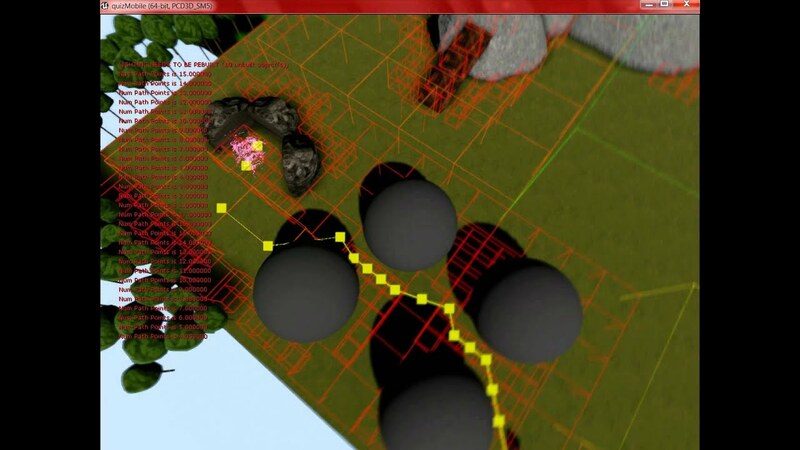 If the physics simulating object is deemed to be a threat by the creature, I would then measure the collision bounds of the physics object and then tell the creature to move to nearby safe zones as determined by my pathing system, using the collision size of the physics object to know which of my pathing spaces will soon be obstructed. It's actually not that complicated! Keep an eye on this thread, I will be posting a video of my AI dynamically re-routing itself based on physics colliding objects very soon! I will definitely keep an eye on the thread and look forward to your video! Well here is my next video! In this video I am showing how my pathing system recalculates the path pretty much instantly to account for physics objects that I drop into the world! First I demo basic pathing, including pathing down a bunch of rocks, over a ramp, and around a 3-directional wall block to get the goal! You are making my brain hurt again, Rama. Amazing stuff as always! Out of curiosity, is it possible to apply "FX" to this data? For instance, what if the path needed to be seen by the player (Like a GPS). I liked the dwarf-dropping ability. Oh and the dynamic pathing too! Great to hear from you Jacky, hee heeee! Ixiguis! How did you know I've been honing my dwarf dropping abilities over many months?! Ahh! FX! Your amazing strength Jeremy! I love to expose my fancy C++ mechanics to Blueprints, I do it all the time! So I could easily make a BP Event that would say "here's all the points and the line directions between the points for the most recent calculated path"
I could easily give you the start points and end points for a series of Beam Particles! Optionally I could set the particle data myself in the C++ if supplied with the Beam and the name of the start and end parameters. But you could use anything really, doesnt have to be Beams. I could supply a whole series of points if you wanted to use point particles effects, or even GPU particles! Also I am about to make the final set of code where the "Best Path" is chosen by the AI and will not change too often, so it will look even better visually! So yes, by using the power of Blueprints I can expose the core C++ data to be used in Blueprints however an amazing FX Engineer like you deems fit! All the debug info can be turned off at any time so only the FX that you are choose are used, changeable any time in BP! That's what I love about BP, gives everyone access and allows me to enable people to customize my handiwork in C++ any way they want in BP! Last edited by Rama; 08-01-2014, 01:03 PM. Thanks for the examples and I can't wait to see the Best Path!